Kate DiCamillo has a gift, inequitably distributed among writers of all kinds, of eliminating the obvious and still egging on the reader. She writes beautifully but thinks simply. The purity of her prose – the reader goes from paragraph to paragraph delighting in the wonderful simple sentences – only adds to the winsome purity of her vision. DiCamillo’s carefully crafted prose creates an evocative aura of timelessness for a story that is, in fact, timeless. Tanaka’s acrylic artwork is meticulous in detail and aptly matches the tone of the narrative. Reading like a fable told long ago, with rich language that begs to be read aloud, this is a magical story about hope and love, loss and home, and of questioning the world versus accepting it as it is. From the unexpectedly miraculous feats of a two-bit illusionist to the transformative powers of love, forgiveness, and a good mutton stew, there is much magic afoot in this fable-like tale… The profound and deeply affecting emotions at work in the story are buoyed up by the tale’s succinct, lyrical text, gentle touches of humor, and uplifting message of redemption, hope, and the interminable power of asking ‘what if? Thoughtful readers will feel a quiet satisfaction with this almost dainty tale of impossible happenings. DiCamillo’s allegorical novel seems to pack more mass per square inch than average. The plot is fantastical, surreal…And the prose is remarkable, reflecting influences from Kafka to the theater of the absurd to Laurel-and-Hardy humor. The mannered prose and Tanaka's delicate, darkly hued paintings give the story a somber and old-fashioned feel. The absurdist elements—street vendors peddle chunks of the now-infamous opera house ceiling with the cry “Possess the plaster of disaster!”—leaven the overall seriousness, and there is a happy if predictable ending for the eccentric cast of anguished characters, each finding something to make them whole. Kate DiCamillo tells a tale of ‘hope, redemption, faith, love, and believing in the impossible’ with her usual quiet elegant prose. Tanaka’s shadowy, evocative acrylic paintings echo the dreamy nature of the storytelling and add a surprising amount of solidity (and a particularly nice elephant). With its rhythmic sentences and fairy-tale tone, this novel yields solitary pleasures but begs to be read aloud. 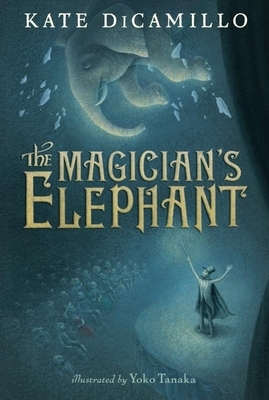 Hearing it in a shared space can connect us, one to one, regardless of age, much like the book's closing image: a small stone carving, hands linked, of the elephant's friends. Though DiCamillo's first success was with realistic fiction, she has since explored fantasy, here looking at how individuals and society take an impossible event into their narrative of the way the world is. Is it broken or fixable by those who embrace the unusual? DiCamillo's elegant, evocative prose underpins the otherworldliness of Baltese, a place where a long-accepted truth can be shattered as easily as an elephant crashes through the opera-house ceiling. Readers willing to venture a little deeper into the darkness will be reassured and rewarded by the singular sense of hope that nearly glows from DiCamillo's prose, and from the incandescent illustrations created by Yoko Tanaka. The power of DiCamillo’s writing enables the hope and determination of the characters to break through the gloom that penetrates the story...DiCamillo has again captured the loneliness and unwavering optimism that can only be found in children. Using short yet powerful sentences and cinematic descriptions, DiCamillo creates another emotion-swelling gem in what is becoming an impressive crown of work. Lyrical language and many interesting characters make this a wonderful read aloud book or one to be savored alone. Bringing all these characters together for a happy ending requires its own special magic, which is enhanced by DiCamillo's finely rendered Old World writing style — and the gorgeously muted pencil illustrations of Los Angeles artist Yoko Tanaka. A fairy tale, a mystery, a truly magical story of love and hope that will captivate readers young and old.